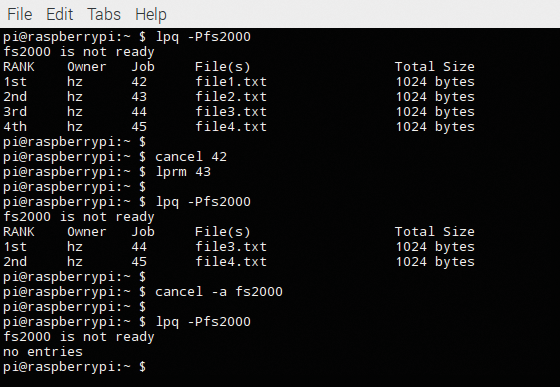 CUPS command-line commands let you quickly print documents remotely to a printer of your choice, print shell script results without user intervention, move print jobs to another printer, cancel jobs, and more. In the first part of this series, "CUPS Administration," published in Raspberry Pi Geek last issue , I showed you how to create and manage printers and queues. In this article, although I distinguish between printers and queues, from the perspective of the command line, these are usually the same thing because multiple queues can be set up for a physical printer. This ability proves especially useful if your printers have various add-ons (e.g., additional paper trays filled with different kinds of paper). CUPS provides two print commands, lp (System V) and lpr (BSD), both of which you can use on the Raspberry Pi. The CUPS developers have expanded these commands with their own options. Table 1 shows the most important commands for everyday work. Thanks to the -o option, both commands open up possibilities to further refine the printing command, such as choosing the paper size, toggling between single-side and duplex printing, grouping pages on one sheet, and much more (Table 2). The output for two pages per printed page, stating the printer. Printing in landscape mode for output to the default printer. Printing to a specific target device with the output adapted to the size of the page. Printing with eight characters per inch to the default printer. Printing at three lines per inch on the default printer. Printing on a specific printer, specifying the required margins. In this mode, the Kyocera FS-2000 used in the test almost reached the number of pages per minute stated in the product manual. You must understand the character-specific settings of the printer to do this, however, and change the character set of the text file accordingly – in this case, the recode character set is used on MS-DOS. The two examples in Figure 1 display the different feedback messages from lp and lpr. When using lp, you receive the job number of the applicable queue, which you can use for downstream processing of the print job. Figure 1: lp and lpr react differently when executing a print command. 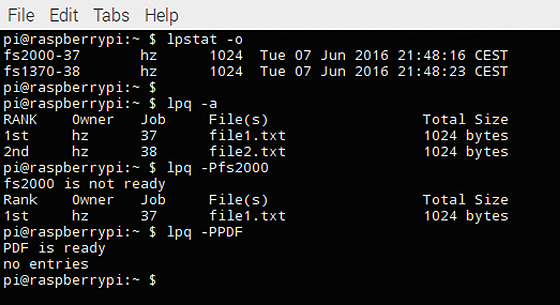 Command-line commands also let you enumerate, move, stop, and delete print jobs. Several commands yield similar actions, because the CUPS project adopted many things simply for compatibility. You can use the commands lpstat and lpq to discover which jobs are currently ready for printing. If you add the -o option, lpstat lists print jobs; if you do not define a specific printer, this command lists jobs from all queues. The lpq command uses the -a option. If you want to restrict the output to a single printer, add -P<printer> to the command. Figure 2 shows some appropriate queries. The first two commands display jobs for all printers. In the third query, lpq informs you that the printer is not currently ready – but this is not true. The last query shows a queue without content; the printer is ready for jobs. Figure 2: CUPS provides several ways to query print queues. Figure 3: If you have multiple printers, the lpmove command lets you move print jobs between printers. The commands cancel and lprm let you to delete individual print jobs by referring to their job number. If so desired, cancel -a <printer> cancels all jobs that are currently waiting for a printer (Figure 4). Figure 4: First, individual jobs are removed from the queue for the fs2000 printer using two different tools; cancel removes the remaining jobs in one go.